Too late for Big Solar to save the day? California utility PG&E on Tuesday announced contracts to buy up to 900 megawatts of electricity generated by solar power plants to be built in the Mojave Desert by BrightSource Energy. It’s one of the biggest solar deals to date — enough to power some 600,000 homes — and is another sign that that the shift from fossil fuels to carbon-free energy is well underway, at least in California. But is it too late? PG&E (PCG) first announced it was negotiating a power purchase agreement with BrightSource, then called Luz II, on Aug. 10, 2006. Around that time, the United States’ leading climate scientist, NASA’s James Hansen, warned that the world had only a decade to take drastic action to cut carbon emissions and avert future catastrophe from global warming. It took nearly two years alone to just hammer out the PG&E-BrightSource deal and the world now has eight years left to radically ramp up alternative energy sources. 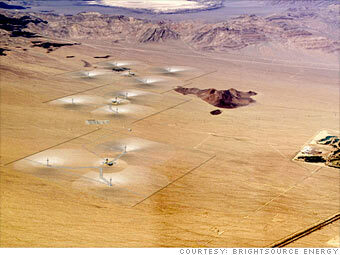 By the time the first BrightSource 100-megawatt solar power plant (image above) goes online it will be 2011 and the last one will begin generating electricity for PG&E just as the climate change alarm clock goes off. If you believe Hansen, hitting the snooze button will not be an option. Partly it’s because the years-long negotiations between utilities and solar power plant companies is something of a black box. Details of these power purchase agreements are kept confidential but are estimated to be worth billions — if a recent $4 billion dealstruck by utility Arizona Public Service with solar power plant builder Abengoa Solar is any indication. Regulated utilities are by their nature big and bureaucratic and can be expected to be extra-cautious when they’re placing bets on untried solar technology from companies like BrightSource and Ausra. Another factor is a regulatory structure that is an artifact of the fossil fuel age. California requires extensive environmental review of new power plant projects — be they clean and green or down and dirty — a process that can take a 18 months or more. And the best solar sites often are on federal land in the Mojave — securing a lease for that land is another 18-month-long process. Still, one looks to history. When the United States entered World War II, it retooled its factories in a matter of months to produce planes and tanks. Climate change is an amorphous but no less dangerous threat and speeding up the regulatory timetable will be crucial in the fight against global warming. The clock, after all, is ticking. I thought Fortune Magazine wanted to be a serious publication. Eco-fascists like Todd Woody are using outdated research and fail to mention that newer research shows no increased temperature in the last 10 years. The research Woody is quoting James Hansen, a well known person from NASA. What may not be well known is that James Hansen in the 1970s was predicting global cooling as the big threat. Bottom line, the more research that is done on the climate, it shows us that it has changed at all times in history whether there have been humans around or not. Most people don’t realize that it was actually warmer in the Middle Ages than today. And there were no SUVs around back then. If Fortune wants to be a serious publication, columnists like Todd Woody should not be included. I’m all for clean power generation, but these two lines are taking the argument of climate change much too far. Show a little restraint! I do like the information (about CA, solar tech, and the companies) and want to read follow-ups. I find CA’s initiatives fascinating. I have to agree though that the assumptions are a bit out of place and distracting as I came to the site to read about innovative business sans drama. I sense government & business (same thing) stalling for time while they determine the greediest course of action. There is one line of research to follow and it should be receiving 90% of research & building funds: solar power combined with energy storage technology. There is purposeful avoidance of this path although it is clearly the best. Greed, greed, greed greed, greed. How about interviewing Al Gore and other such big name guests to continue help to force business and government to act now? The press won’t admit it (sour about Kyoto and political postering) but Chinese CO2 emissions exceeds that of the US now. One should also note China burns the filthiest soft brown coal it can put it’s hands on and uses the leftover soot (what doesn’t float up into the clouds) as a colour enhancer for food products meant for the world market (goes under the name of caramel #2020). Comparing the threat from the Axis in WWII to climate change is downright ludicrous. The level of journalistic responsibility here, both on the part of the author and the editor, are well below the standards of FORTUNE. And, for the record, I am a staunch supporter of solar, nuclear, and wind energies. Articles like this one do not help advance the cause. Government needs to be more cooperative with industry in regards to solving global warming problems in the shortest amount of time. Cut the red tape. Sad to see the Republican Luddites are still alive and kicking (KJ and John). Oh yeah, there no evidence of global warming…and by the way, the earth is still flat. I fear we will pay a harsh price in the future due to these dysfunctional, medieval, backward Republicans, led by the worst President ever–the incurious one. If FORTUNE and Todd Woody are serious about global warming then they should be harping on the Northeastern US to get rid of all oil burning furnaces and water heaters. Replace those furnaces with ground source heat with solar electric, grid electric or natural gas as backup. Replace water heaters with solar hot water heaters with solar electric or grid electric as backup. A lot of oil and carbon could save if the Northeastern US states mandated these requirements. This kind of idiocy is what makes the global warming cloud a laughing stock. Jeff, stooping to name-calling simply indicates the weakness of your argument. I (and the science) agree with their positions. Any argument from the global warming crowd can be dispelled by simple science. The climate models have been **scientifically proven** to be incorrect. In the past 12 months, the four major temperature monitoring organizations (NASA, etc.) recorded a drop in global temperature that erased nearly 50 years of global warming. The Antarctic ice mass has returned, Baghdad has seen its first snow in recorded history, China has reported the coldest winter in its history, etc. In light of these facts, now what? If you want some good references on the scientific skepticism of man-made global warming (keep in mind the climate has never been truly stagnant – it’s a dynamic situation), check this out. Yes, it’s an opinion piece, but the opinion is based upon facts. Each highlighted reference is a link to a news story backing the claim. on April 5, 2008 at 6:16 pm | Reply Steve,Buffalo,>N.Y. I think even if global warming is a fact or not,it should not be the question. Renewable resources and renewable resource technologys is a imperative that would ease our hunger of gas and oil(foreign or domestic). We don’t have an endless amount of fossil fuels and the sooner we can get off them the better it will be economically. Dear Fortune, This article was disappointing. FYI – Apparently China is building 20 new nuclear power plants. The US is currently planning on building 6 and it’s costing us about the same b/c of environmentalist produced red tape. Who are the greedy ones Mr. Nytid? I think we should be more greedy and demand building at least 20 nuclear PP and drilling in ANWR and Otero Mesa in the mean time. Solar and wind energy are pathetic sources of energy. Let’s stop having our money wasted for us. The biggest threat to our country is ignorance and lack of action by those of us who should know better. on April 20, 2008 at 12:04 pm | Reply Infidelz, Sunny Lex Park MD. Indeed, I am melting. In but 8 years we will all be cooking our eggs on the sidewalks . Thank the Gods we have airconditioning and the good sense to make lots of money. Can’t wait for the new Dodge Challenger with its 400+ carbon burning necksnapping horse power. Let the good times roll baby!! Scott, the winter just past is abnormal by recent medium-term standards. One thing that happened is that the sun went more or less flatline, following the extended period of severe CME and other activity which also spanned the heaviest of the recent hurricane seasons. Many scientists acknowledge that this space weather has major influences on Earth’s weather, and the flatline period appears to be ending, so we shouldn’t drop our guard. Some even are expressing legitimate concern about some of the further-out activities going on in the fields of high-energy and particle physics, where some local events might act more than globally, spatially as it were. On a more mundane level, some have expressed confusion and alarm that while temperatures have cooled, the decay of structural ice, meaning the larger features such as glaciers and caps, has continued to take place. I believe you are mistaken when you state that the “mass” of ice has returned, this is the type of mass that takes decades to centuries to accumulate, where much of what was replaced in a year is more superficial rather than structural. I believe there are 2 influences to consider regarding Global De-Icing, and only one is obvious: air and water temperatures relative to the melting point of pure water. More subtle, but in the long run possibly more severe, would be the issue where the melting point of large areas of ice itself is dropping, as global ice cover is denatured, so to speak, by atmospheric contaminants. The most important of these contaminants, I fear, represents the “charge-back” of the bio-fuels “free lunch program”, and by that I do mean ethanol. Think of hundreds of millions of cold-started vehicles fueled on 10 percent ethanol. The ethanol is added at the pump. It is a fairly unstable mix, and the ethanol portion is water-soluble in the tank, and after partial combustion in the cold-running engine, equally water-soluble and chemically persistent in the atmosphere, AND IN ICE. See the problem? Why don’t the lawmakers see it? Ethanol, the known dehydrator in alcoholics, dehydrating and de-icing any areas it is able to permeate, not to mention the potential influence on atmospheric volatility. That’s the other head-scratcher. We’ve been told ad infinitum that rising temparatures are the sole cause of the added volatility in our weather. Take a close look at this year, the new ethanol regulation in 5 Southern US states, the types of storms, the winter tornadoes even in large Metro areas which were usually thermally sheltered from those. The tendency towards cyclonic air mass activity over land. Where did all this come from? Prove me wrong.